A Midwestern mid-winter termite inspection makes for a literal COLD-case file. Dave Daniels of Speed Exterminating uses a long metal poker to investigate for evidence of termites around basement insulation. 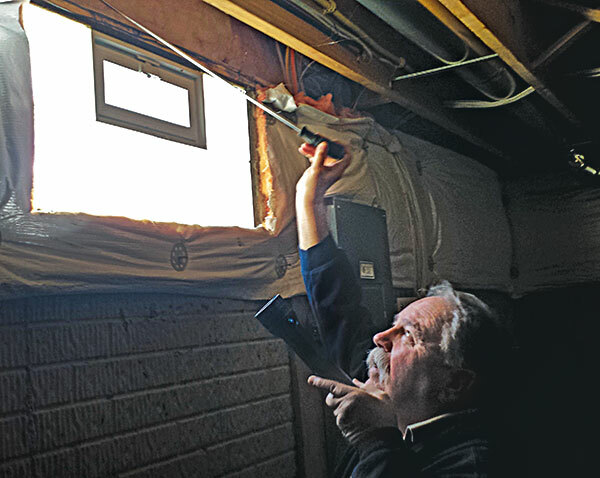 Conducting a termite inspection in Ohio in the dead of winter seems counterintuitive; you’d be forgiven for thinking we should have our heads examined for seeking one out. However, in our pursuit of a less-traditional ride along story, that’s exactly what we did — courtesy of our friends at Speed Exterminating in Cleveland. When I first spoke with Speed’s fourth-generation president, John Young, in February, he barely hesitated when we told him what we were looking for. “A termite inspection? Yeah, I think we can do that,” Young said enthusiastically. He did do that, and in short order too, informing me that, as early as the next day, I could ride along with a technician who was doing an inspection on a “relocation job.” That means Speed Exterminating had been hired by a relocation company to inspect a home at the center of a real estate transaction. There are many reasons why relocation companies are hired, but their primary function is to take over the role of seller from the current homeowner in a situation where he or she is forced to move for their job. Relocation companies are extremely risk-adverse and often use contractors for a variety of inspections, including termites. Dave Daniels, the Speed Exterminating technician who was kind enough to let me tag along, explains on the drive to the property that this type of inspection is fairly common for the company, and that the age of the house being inspected often had a direct correlation to the likelihood of finding any pests. In this case, the house was fairly new. That bit of knowledge disappointed me somewhat at first — until we got inside. A cluster of dead multicolored Asian beetles prove easier to find than termite evidence. The primary focus of this inspection would be the home’s basement, foundation, garage and exterior. 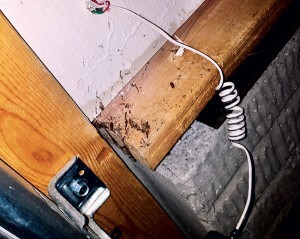 “There’s not much swarming this time of year, but if you know where to look and what to look for, you might find some interesting things,” Daniels says, referring to evidence of termites and termite swarms from seasons past. Armed with his clipboard, notebook, a heavy-duty flashlight and a long metal poker, Daniels leads me to the clean, unfinished basement of the two-story home. After doing a preliminary look around, he produces a form from the folder. Daniels begins his inspection in earnest in an open crawlspace, the only area of the basement truly cluttered enough to require moving items out of the way. When that corner of the basement receives a clean bill of health, Daniels redirects his attention to the nooks and corners, both above us and at floor level. However, he almost immediately notices something at eye level. In this case, there was no evidence of insect activity. 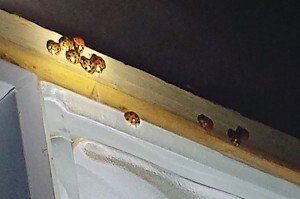 Further inspection of the basement turned up some insect inactivity: We encounter several dead multicolored Asian lady beetles on the floor beneath a basement window. More were found on the window’s sill, just above our heads. Daniels indicates all of this on his chart and inspection forms. In the garage, an abandoned spider web indicates past pavement ant activity. Next, Daniels directs my attention with his flashlight beam to where the basement wall meets the basement floor. Daniels then does a slow sweep of the walls with the beam of his flashlight. He points out polyvinyl chloride (PVC) plumbing pipes that extend up to the home’s first floor. He mentions that on some inspections, he’ll see termite mud tubes extending all the way up the pipe. Though there are none here, the search continues. Daniels says as he inspects, he’s looking carefully for another telltale sign left behind by swarming termites: cast wings from swarming reproductives. But again, no such evidence is found. Trying to be helpful, I point out a loose pile of wood dust on the floor. Directly above it are the first-story floor beams. That could be termite evidence, right? Not so fast, Daniels says. 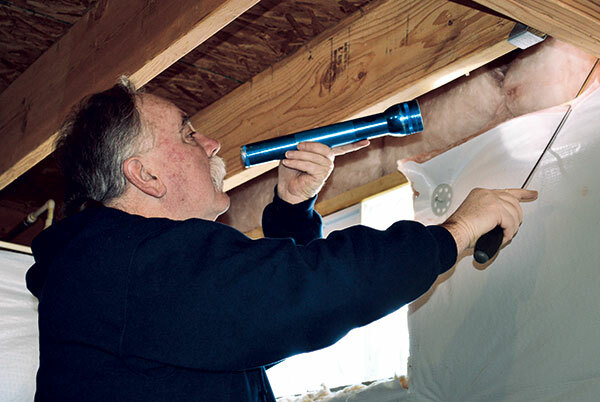 “It’s the same mistake many homeowners make,” he explains, shining his flashlight first on the pile, and then swinging the light up to the beams above us. Now we can easily see that a hole was drilled through each beam, to accommodate a cable that runs along the length of the basement threaded through the holes. The composition of some types of insulation can act as a termite food source. With the basement fully covered, we move to the home’s attached garage. Not unlike the basement, the garage is exceptionally clean. To Daniels’ fine-tuned eyes, however, the potential havens for termite evidence are obvious. The garage appears to be immaculate at first glance, but Daniels directs his flashlight beam to a floor corner covered in spider webs. Daniels proceeds to sweep his flashlight beam around the garage perimeter, giving special attention to the floor and ceiling corners where he says we’re most likely to find more webs or insect-constructed holes. We find spider webs with catches, but no termites. We wrap up our inspection of the garage by closely inspecting the wooden framing around the garage door. Daniels explains that sometimes you’ll find ant entry points here — if not evidence of termite activity — but today, the wood is free of any such indicators. Outside, we take our time moving around the perimeter of the entire house and garage. Most of the areas around the foundation are still covered in snow from the last snowfall, and Daniels indicates this in his report. While termite evidence continues to elude us, Daniels’ keen eye spots a mouse entry point under a downspout behind some leaves. 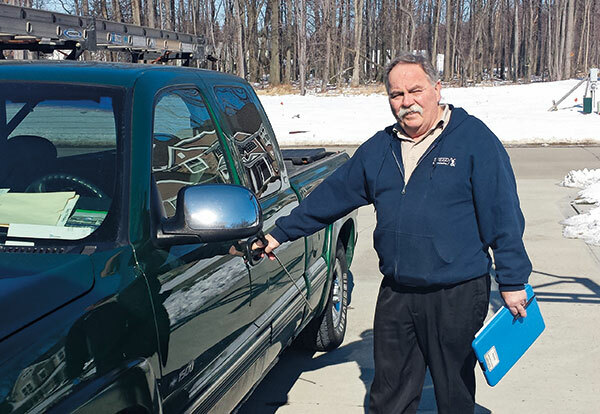 Daniels’ thorough inspection reveals a termite-free home. All around the foundation, we find a band of foam insulation buried just below the surface soil. Daniels wraps up the visit by filling out the forms he used to log what he’s found. No termite activity finds its way into the log, but that’s OK, because we didn’t expect to find much (if any) anyway. The relocation company now has a few other pest concerns to deal with, but termites aren’t one of them. Then again, that’s why it’s called an inspection. - Can you see the termite forest for the trees?